Recently, I took a trip to the Laguna Art Museum. Amidst sunny skies and pristine beaches, I decided to duck into this small but well-organized museum to see the artistic highlights of Laguna Beach. 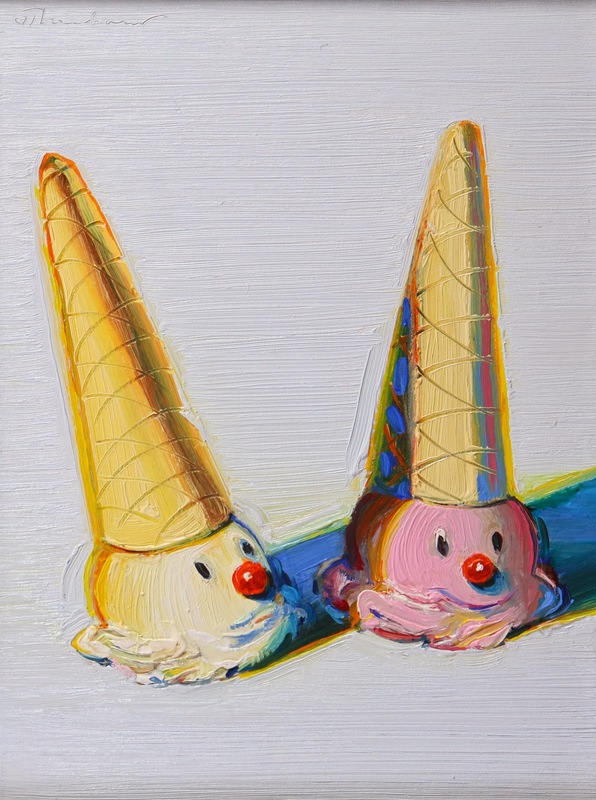 Wayne Thiebaud’s American Memories, which covers the 93-year old artist’s career from 1959 to 2014, is a most delightful exercise in pure happiness and the joy of living. Best known for his edible-looking paintings of cakes, pies and other delicious foods, Thiebaud is also well-regarded for his incredible landscape painting as well as his vivid, memorable use of color. On display in American Memories is a large sampling of his capabilities, from black-and-white lithographs and etchings to oil paintings, pastel works, and watercolors. To first enter American Memories, one would think that for Thiebaud, his American memories center on the phenomenon of delicious food and of consumption, but walking throughout the rest of this expansive exhibit reveals a much brighter and joyous theme. 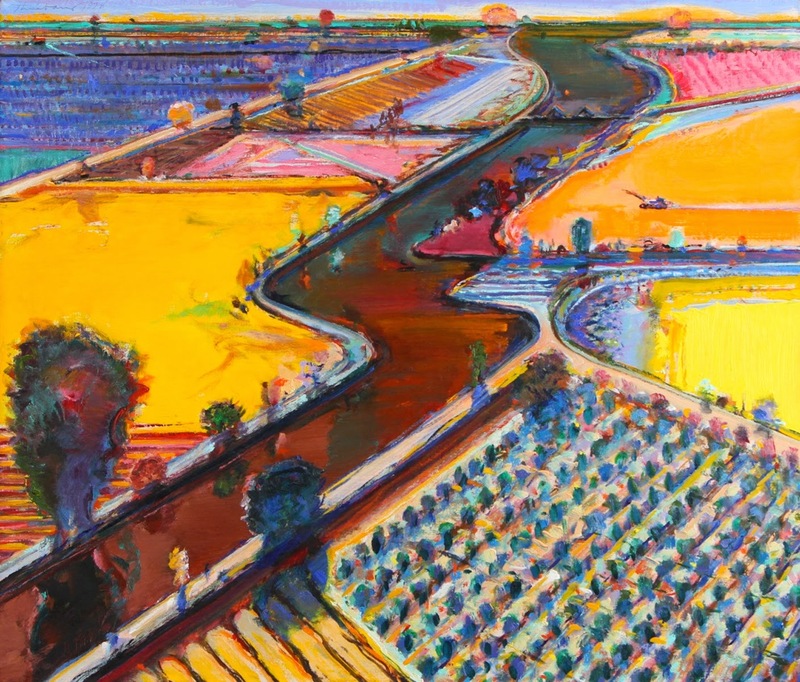 While his works depicting food are charming and iconic, the true genius of Thiebaud lies in his approach to landscape, both rural and urban, and his genius facility with color, which American Memories places on full display. An early highlight is Nine Beach Figures, which conjures keen nostalgia for a childhood spent in the sun in the company of loved ones, with its thick, deft paintstrokes and the brilliance of blue shadows on yellow sand. On the whole, Thiebaud’s landscapes in this exhibit comprise some of the most breathtaking painting I have seen all year, combining elements of the coloring of Gaugin and Cezanne. The aerial views, including Reservoir Bridge and Flooded Waters and Brown River are lovely and memorable for their confidence and the sheer enjoyment evident in their creation. The absolute highlight of the show, however, is Canyon Bluffs, an outstanding oil painting depicting a stark blue vertical set of cliffs highlighted with pale lavender and yellows, the forms almost abstracted into pure color. Moving throughout the exhibit, Thiebaud’s idiosyncratic, highly vertical depictions of San Francisco streets are also incredibly engaging. In a video accompanying the exhibit, the artist explains that he sought to capture the feeling of the steepness of the San Francisco city streets, and that he does, creating strange, unforgettable views of a city that exists on no map. Coming from a stylistic standpoint, his landscapes and even his portraits, which use his remarkable palette to breathe life into the figures, are far more impressive than his food paintings, yet all of his works are imbued with a true lust for life. For Thiebaud, his American memories center on a combination of places and objects. He captures the delight a child has in everything the world has to offer, from a pair of shoes, to a pair of ice cream cones, to a high up view of street from outside a window—he delights in living. In contrast to the lightheartedness and vivid color of American Memories, Dana Harel’s Between Dreams and Nightmares, located in the lower level of the museum, contains brutal, haunting black-and-white graphite and mixed media works centering on how war and violence affect soldiers. 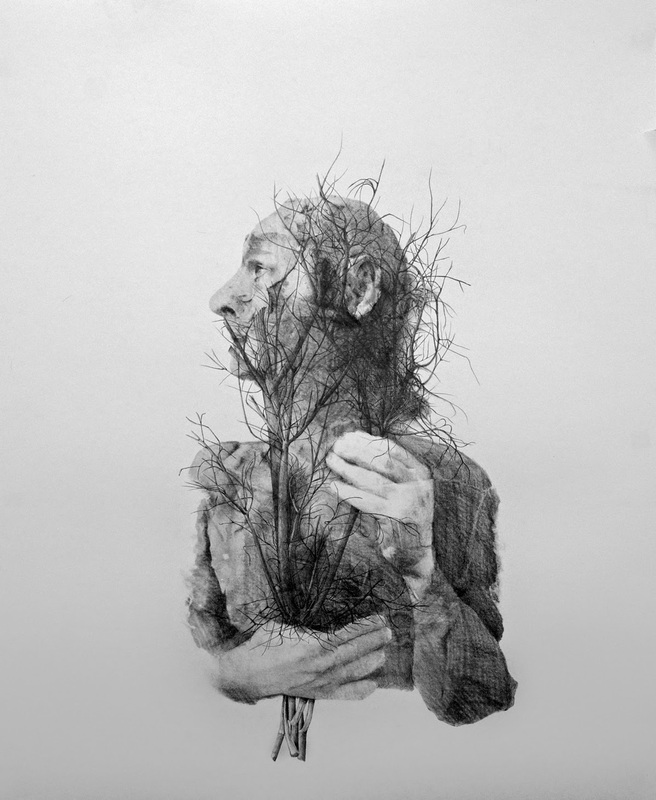 According to the artist, drawing upon inspiration from the members of her family who have been soldiers, as well as her own personal experience, Harel has created subtle yet arresting works that come to life in this grittier gallery space. The works have a solemn, monumental quality, relating the male figures of the soldiers with corresponding animal motifs, which, according to the artist, symbolize how war and battle bring out the beast in humans, so to speak, and that returning to civilian life means having to grapple with the monstrosities within. Harel’s handling of light and shadow in her works is masterful, as if she has photographed marble in black-and-white. The solidity and power of her figures recall the works of Maurice Sendak, with their sculptural forms suggesting drying clay. An early highlight in Between Dreams and Nightmares is the large-scale Wrestling God, which depicts a male figure bent over in effort as he struggles against a fluttering, evanescent pile of feathers, perhaps representing a wing of an angel. 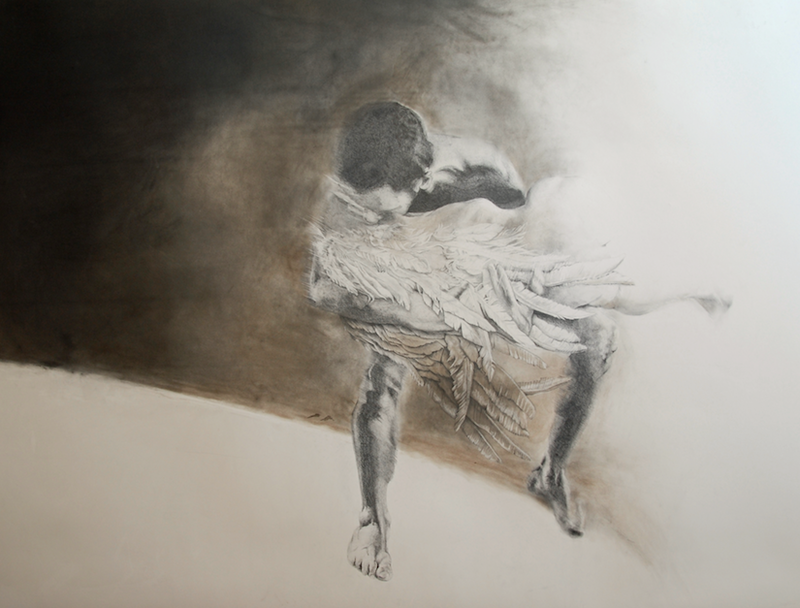 The work recalls the Biblical tale of Jacob wrestling with the angel, and perhaps symbolizes that in order to draw upon the monster within to go to war, we must wrestle with the God, the purity and goodness inside ourselves. A further highlight includes Only in Human Eyes, a diptych which depicts two half-rendered human faces threatened by looming lion and tiger mouths, roaring behind them. These startling works truly represent the war that continues after the soldier has left the battlefield—the monster that the now-civilian must suppress even as it roars over his shoulder, demanding to be acknowledged. Only in Human Eyes serves as a powerful reminder that once it has been activated, we can never truly suppress the dark and brutal sides of ourselves—we must devote our lives to trying nonetheless. These two shows, while wildly differing in their themes and moods, are profound visual experiences that take the viewer to emotional highs and lows. They are a delight to behold. These shows ran until June 1, 2014. I loved these two exhibits and enjoyed seeing them with you and now again through your eyes. Nice review!